Almira Holcombe married William Matthews. Almira Holcombe was born circa 1839 at PA.1 She was the daughter of Asa Holcombe and Fanny Orcutt. Viola Holcombe married George H. Brown. Viola Holcombe was born circa 1846 at PA.1 She was the daughter of Asa Holcombe and Fanny Orcutt. Orson Holcombe was born circa 1848 at PA. He was the son of Asa Holcombe and Fanny Orcutt. Achsah Sanders was born circa 1814 at NY. She married Luman Holcombe, son of Asa Holcombe and Lucinda Miller. Frances E. Holcombe was born at NY. She was the daughter of Luman Holcombe and Achsah Sanders. [S25] Hannah McPherson, Holcombe Genealogy, Page 133.2/Item A-8-1-2-9-5-4-1. [S25] Hannah McPherson, Holcombe Genealogy, Page 133.2. Orla H. Holcombe was born circa 1851 at PA. He was the son of Luman Holcombe and Achsah Sanders. J.J. and J. E. were enumerated in the 1870 Cormeantville, Spring Twp., Crawford Co., PA, federal census. He was 29, she was 29. Children in the household were Homer 3, and Grant 1 month. [S25] Hannah McPherson, Holcombe Genealogy, Page 133.2/Item A-8-1-2-9-5-4-4. Leon Holcombe was the son of Orla H. Holcombe and Nellie Seward. Hazel Holcombe was the daughter of Orla H. Holcombe and Nellie Seward. Mildred Holcombe was the daughter of Orla H. Holcombe and Nellie Seward. [S25] Hannah McPherson, Holcombe Genealogy, Page 133.2/Item A-8-1-2-9-5-4-4-2. [S25] Hannah McPherson, Holcombe Genealogy, Page 134.1/Item A-8-1-2-9-5-4-4-4. Ralph Homer Holcombe was the son of Homer J. Holcombe and Alberta Cau. Ralph graduated Warren, Ohio, High School, 1913, Oberlin College, June, 1917; in May 1917 he enlisted with Lakeside Hospital Unit, and went to France; was there until April 1919; left Oberlin one month before graduation exercises, but got his diploma as he had passed exams. [S25] Hannah McPherson, Holcombe Genealogy, Page 133.2/Item A-8-1-2-9-5-4-4-2-1. William Henry Holcombe was the son of William Horace Holcombe and Hannah Hickley. William Horace Holcombe was born in September 1837 at Knoxville, Knox Co., IL.1,2 He was the son of William Horace Holcombe and Hannah Hickley. William Horace Holcombe married Elizabeth Munson in 1866 at New Haven, New Haven Co., CT.1 William Horace Holcombe married Mary Crossette in 1896 at Hinsdale, DuPage Co., IL.1 William Horace Holcombe died in March 1908 at age 70. He was buried at Hinsdale, DuPage Co., IL. William Horace Holcomb, Jr., was born in Knoxville, Illinois, in 1840, and he attended Knox College. He was in the Union Army from 1861-1865, during the Civil War. He served as a sergeant in the First Illinois Cavalry, and he was mustered out as a captain. In 1866, Holcomb was married to Elizabeth Munson at New Haven, Connecticut, and the couple had three children, William H., Herbert W., and Anne. Shortly after his first marriage Holcomb purchased a lumber yard in Maquon, Illinois. He and his family resided there for two years, and then Holcomb sold the lumber yard and purchased a farm near Paxton, Illinois. In 1871, when Francis E. Hinckley was building the Chicago and Iowa Railroad from Aurora to Forreston, he hired Holcomb, who was his cousin, to come to Rochelle and be general freight agent and all around man for the road. In 1874-1875 the Chicago, Rockford and Northern Railroad built a road running north from a junction with the Chicago and Iowa Railroad at Flagg Center to Rockford. Part of the road was built about three miles east of another south-north road that the former Rockford Central Railroad had planned and worked on in 187101872, and then abandoned shortly afterward. Hinckley and Holcomb of the Chicago and Iowa Railroad helped plan and build the south-north road for the Chicago, Rockford and Northern Railroad. Holcomb and several large landowners between Rockford and Kings were instrumental in causing the railroad to be built about three miles east of where it had been previously planned and partially built. In 1875, the village of Davis Junction was platted near the junction of the new south-north road and the new Chicago and Pacific Railroad running east and west. In 1875, the village of Holcomb was laid out along the new south-north road in the area between Davis Junction and Kings. It was platted in 1876 and named in honor of Mr. Holcomb because of his efforts to put the road through that area instead of further west, through White Rock, as formerly planned. The village of Kings was laid out in 1875, and platted in 1877. In 1877, after the Chicago and Iowa Railroad got into financial difficulty, Holcomb was appointed receiver and general manager, and he occupied that position for eight years. Owing to his good management during that period the road was placed on a paying basis. In 1872-1873, Holcomb built a large red brick and limestone house in Rochelle, on the southwest corner of Seventh Street and Sixth Avenue. (At the date of this writing, 1976, the house is still standing. In 1973 it was placed on the Illinois Register of Historic Places and on the National Register of Historic Places.) Holcombe held the office of alderman in Rochelle in 1874-1877, and he served as mayor of Rochelle in 1878-1880. He also served as a member of the school board and in other positions. After Holcomb's receivership for the Chicago and Iowa Railroad ended and the road was absorbed by the Burlington Northern Railway, he served as superintendent of the division for a short time. Then he became superintendent of the Burlington Northern Railway with headquarters in LaCrosse, Wisconsin. 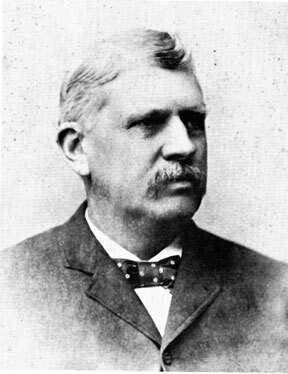 Later, Holcomb was superintendent of the Oregon Short Line Railroad and also manager of the Oregon Railway and Navigation Company. At the time he was stationed in Portland, Oregon. After a short time in that position he became superintendent and vice president of the Union Pacific Railroad. The road was between Omaha, Nebraska, and San Francisco, California, and the Holcomb family lived in Omaha. In 1891, Holcomb and his family returned to Illinois and made their home in Hinsdale. Holcomb took an active part in the management of the transportation section of the Chicago World's Fair of 1893, from its start to its completion. Holcomb's first wife died in 1892, and he married Mary Crossette at Hinsdale in1896. In about 1905, Holcombe's second wife was injured in a railway accident in Kentucky, and she died later in Nashville, Tennessee. During Holcomb's late years his interest continued to be in railroads and railroad supplies, and he had a business office in Chicago and two in the South. Holcomb died in March, 1908 and was buried at Hinsdale. William and Elizabeth were enumerated in the 1870 Harwood, Champaign Co., IL, federal census. He was a farmer, age 32, she was 26. Children in the household were William 3, and Herbert 10 months. Also enumerated in the household was Charles Holcombe, 28. William and Elizabeth were enumerated in the 1880 Rochelle, Ogle Co. IL, federal census. He was 41, she was 38. Children in the household were William 12, Herbert 10, and Ann 9. William and Mary were enumerated in the 1900 Hinsdale, Downers Grove Twp., DuPage Co., IL, federal census. He was the superintendant of a coal mine, age 62, she was 53. The only child in the househodl was Anna 29. Mary Jane Holcombe was the daughter of William Horace Holcombe and Hannah Hickley. Charles Francis Holcombe was born circa 1841 at IL.1 He was the son of William Horace Holcombe and Hannah Hickley. George Henry Holcombe was the son of William Horace Holcombe and Hannah Hickley. Phebe (?) was born circa 1781 at possibly CT.1 She married Jesse Holcombe, son of Ezra Holcombe and Phoebe Gillet, circa 1798 at possibly Granby, Hartford Co., CT.1 Phebe (?) died on 5 August 1801 at Village of North Granby, Granby, Hartford Co., CT; of consumption. Dean Warber was born in 1957 at Sycamore, IL. He was the son of Howard Laverne Warber and Esther Marie Schmitt.